In the airplane movement baby lifts both arms and legs off of the ground at the same time, with the arms straight out to the side. This happens when baby is in tummy time. To teach baby to keep her hands on the floor, and even learn to push up with them, you can try a few exercise with her. Start with her on her back and try bending and extending one arm several times. Move her hand toward the ceiling to extend (straighten) it and bend the arm by bringing the elbow down toward the floor. As you extend her hand toward the ceiling, gradually move her hand so it is more over the middle of her body (her breast bone). She is familiar with the pattern of reaching her arms straight out to the sides as she does in the airplane action on her stomach. This exercise is giving her the experience of moving her arms more toward her center, a less familiar place. As she gets familiar with this place in space it will be easier for her to find it when she is on her stomach. 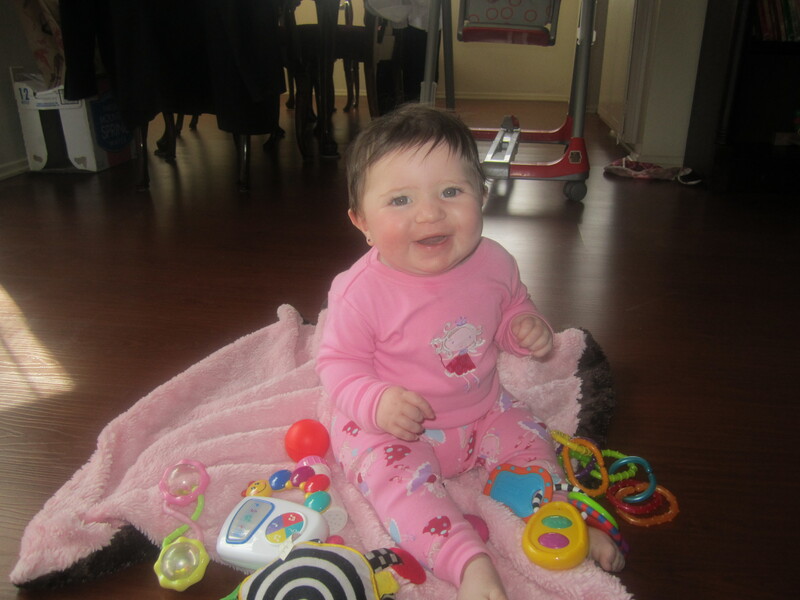 Try put her in tummy time and give her a toy that she will want to explore with both hands. This will bring both hands more toward the midline as keep them there for awhile as she plays with the toy. When she does have her hands on the floor you can lightly brush the tops of her hands with your fingers and gently press the palm of her hand down to cue her to push that part of her hand into the floor. This is “grounding the airplane,” helping baby connect to the floor. Baby will learn that the floor is helpful for her, for example, the more she leans on it the higher she can lift her head. How do we ground the legs? When she is on her back try brushing the legs with your fingers from the top of the hip to the tips of her toes. Make long brushing strokes with your fingers so she develops clear proprioception of the legs. When she is on her tummy repeat this brushing of the legs so she becomes aware that she is lifting them off of the ground. Then gently press her pelvis down into the floor so she feels the contact there. Then try gently moving one leg further away from the floor a few times to go with the pattern she is activating. Then bring her thigh a little closer to the floor and gently press it into the floor so she has the sensation of it leaning on the floor. Repeat this a few times. You are giving her the experience of feeling what it feels like to move the leg further away from the floor and to lean on the floor. Her system will soon choose the more efficient pattern, which is leaning on the floor. Take a moment and ask yourself if you occasionally hold baby up toward the sky like and airplane. If so, observe how her arms go straight out to the sides and her legs go up. This activity can trigger the startle reflex. She may be learning this airplane pattern in this activity. Take a break from this activity for awhile and try some other developmental games suggested in this post. Motor boating, also known as blowing raspberries, is a very playful and developmental activity for babies. The funny sound intrigues their curiosity and they are inclined to try and imitate you. Motor boating gives a strong sensation to their lips, enhancing awareness and facilitating speech development. For speech development, babies benefit from activities which increase their ability to move their lips and tongue. You can help baby learn to create this sound by repeating it a few times with your face close enough to baby’s so she can clearly see how you are moving your lips to make the sound. Do not be surprised if she wants to reach out and touch your lips as you make that sound. Let her feel what you are doing. You can also make the sound on the back of her hand to give her yet another sensation of the sound and movement. Watch the baby in the above video from Jen McBrayer’s youtube channel. She makes a very clear motor boating sound and confidently can repeat it over and over again This shows that she has developed the skill very well. In our Stellar Caterpillar classes we guide babies through motor skill development so they develop their skills in such a way that they can repeat them confidently and whenever they desire. This is different from a skill that happens occasionally or is just half-way developed. As your baby begins to make the motor boating sound, repeat it back to her. This is called mirroring. As you mirror what she does it helps her to be clearer herself about what she is doing. Babies learn this skill at various ages. Some babies learn to motor boat quite young and others learn it a bit older. What is common is that they really enjoy it once they learn it! 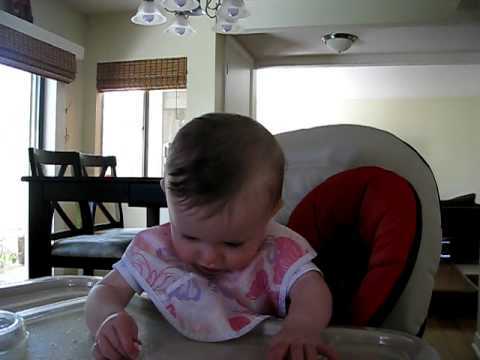 The mother in the above video is also demonstrating a method of feeding baby so she does not throw food on the floor. She puts just enough in front of her for one bite. After she eats that bite her mother puts another bite in front of her. They continue this pattern of eating until baby is finished eating. Baby continues entertaining herself by motor boating in between bites. Sing this song for a fun developmental activity for baby. Touch their hair with both palms of your hands as you sing “Head,” touch both of their shoulders as you sing “Shoulders,” squeeze both of their knees as you sing ‘Knees,” and tickle their toes as you sing “Toes.” Take the tips of your fingers and touch near their eyebrows as you sing “Eyes,” touch their ears on the word “Ears,” take one finger and touch the lips on “Mouth,” and then touch the nose on “Nose.” When you touch a part of their body at the same time that you sing the name of it, they pay attention to the place and learn the word associated with the body part. Park, Alice. “Exercise During Pregnancy May Boost Babies’ Brain Activity,” Time, November 11, 2013. Time magazine’s Health & Family section featured an article on the positive effects of exercise during pregnancy. According to Alice Park, this is the first study to connect mom’s exercise with baby’s brain function. This study is significant because many people think that while pregnant it is best to “take it easy.” Although some medical issues require extra rest, research is starting show the benefits of maternal exercise during the pregnancy period. Always consult your doctor for guidelines for keeping your exercise from being too strenuous during pregnancy. Scientists at the University of Montreal tested the brain function of days old infants by sticking 124 electrodes on the babies’ heads. While the infants slept the researchers monitored how their brains processed sounds. Researchers concluded that the babies’ brains showed a maturity of function only 8-12 days after birth in the research group of babies born to mothers who exercised regularly. The research was presented for the first time at the 2013 Neuroscience conference in San Diego. Although exercise for pregnant women has been previously recommended, the goals were to prevent obesity by keeping maternal weight down and to prevent gestational diabetes. 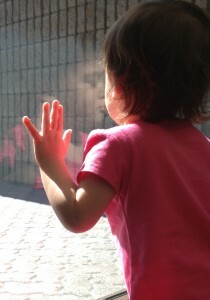 Research shows that obesity may contribute to autism and developmental delays in baby. Keeping maternal weight at a healthy level is extremely important. Gestational diabetes may result in complications for the mother and/or the baby. According to the Mayo Clinic gestational diabetes complications for baby include excessive birth weight, respiratory distress, low blood sugar, type 2 diabetes (occurs later in life), and jaundice. For the mother the complications include high blood pressure, preeclampsia, eclampsia, and future diabetes. With this new research there is yet another benefit for baby to some regular exercise during pregnancy. This sense of independence begins to evolve after the 7th month and is an important cognitive milestone and is often referred to as “self-recognition.” It takes time for baby to learn that the mysterious person they see in the mirror is “me.” Studies were conducted where researchers put rouge on the noses of babies to see if they would learn that the rouge on the nose of the baby in the mirror was also rouge on their nose. The researchers discovered that much of the self-recognition develops between the age of 1 and 2 years. First, remember to practice baby safety. Purchase a mirror that is unbreakable or hold baby in front of a secure wall-mounted mirror such as one in a bathroom above the sink. For young babies you can find small mirror to put near her on the floor so that during tummy-time baby will lift he head and see the sparkle of her moving reflection. Try sitting on the floor with baby on your lap or holding her in your arms in front of a large mirror so she can see her reflection and watch it move as she moves. Much of the fun of mirror play occurs through movement, watching the person move as baby moves. Or, watching mommy move in the mirror. For older babies, use the mirror as a tool for teaching baby a few parts of the body such as “eyes,” “nose,” “ears,” “hair,” and “mouth.” This developmental play is a game that can be played almost anywhere since a mirror can be found in most homes, airport bathrooms, and stores.